MeetFactory is a non-for-profit international centre for contemporary art in Prague. Its mission is to foster a dialogue between individual genres and make the current happenings on the art scene accessible to the widest public. 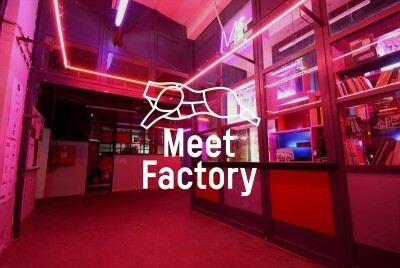 MeetFactory supports original projects in the fields of visual arts, theatre and music as well as interdisciplinary and experimental platforms. It aims to create a space where art is alive and artists are present, enhancing a direct exchange between international artists and the visitors, as well as between different fields and generations. The program of MeetFactory consists in four dramaturgic departments. The music programme presents the international independent music scene, holding six to eight performances per month in the music hall fitted with high-end audio equipment. The theatre program focuses on contemporary prose, as well as experimental interdisciplinary projects, often involving visual artists, musicians, or non-actors. The three galleries offer space for critical confrontation of the national and international art scenes. The MeetFactory Gallery focuses on original curatorial projects, while the Kostka Gallery presents solo shows of emerging and established artists. The program of the Wall Gallery, a side-facade of the building, comprises of large scale realizations beyond street art. The international Artist-in-Residence program is the largest studio program in the Czech Republic. MeetFactory facilitates fifteen studios, which annually host over thirty visual artists, curators, musicians, theatre directors or writers.